Exporters, Based in India. These Neem Products have Served Several Medicinal Uses and Provide Benefits to Number of People. For centuries, the people of India have utilized the Neem tree (Azadirachta indica) for its variety of medicinal uses. The seeds, twigs, leaves and bark of the Neem tree provide so many benefits that the Indian equivalent to the American Food and Drug Administration (FDA) believes that "anything from Neem has to be good," according to R.O. Larson, a contributor to the book, Neem, A Tree For Solving Global Problems. Fruit from the Neem tree contains kernels which are rich in oil. Scientific research has confirmed that Neem seed oil and oil extracts are non-toxic to mammals and are very effective organic antiseptic, antifungal, antibacterial, antiviral, dermatological and dental agents. Much of the current research internationally is focused on the use of Neem seed oil as an organic alternative to toxic/synthetic chemical pesticides and insecticides. Knowledge accumulated to date suggests that Neem seed oil will effectively get rid of over 200 pests and diseases from plants and animals. 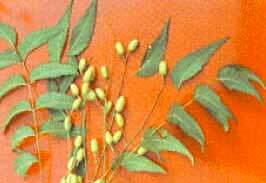 The Neem seed oil does not kill on contact, rather it inhibits feeding and reproduction. The bitter principles from neem kernels act as potent insect anti-feedant and of the sixty or so bitter compounds available in neem seed kernel. Modern Science has isolated & identified Azadirachtin as the Chief ingredient in Neem Seed responsible for the Action on the pests. The extraction of Azadirachtin from neem seed kernels and its formulation with solvents and surfactant ensure high efficacy and shelf life. It has insect growth regulating and insect repelling properties. It acts against as many as 200 species of insects responsible for damage of crops. Neem acts as a biopesticide at different levels and ways. This is very important since the farmer is used to the knock out effect of chemical pesticides. Neem does not exhibit this type of effect on pests but affects them in several other ways. Stable for a period of 18 months from the date of manufacture. Toxicity : In toxicological studies carried out in the USA and Germany, different neem product were neither mutagenous nor cancerogenic, and they did not produce any skin irritations or organic alternations to mice and rates even at high concentrations. In another Canadian study, Neem was found to be harmless to Aquatic invertebrates and other non-target species.